Steve Corr is a big man with a big dog and a big love for the Denver Broncos. His office manifests those things he loves; sprinklings of orange and blue point to his home state, a map of Ireland symbolizes the family bloodline. 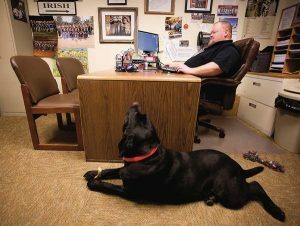 He has even tracked the royal lineage of his massive black lab, Jeep, who lounges around the office while Corr works at his computer. Above all, Corr has a big heart for people who live with disabilities. And he cannot stand it when people choose not to care about them or their struggles. Corr has a “Do Say, Don’t Say” poster hanging next to his desk at the Disability Action Center NW in Moscow. It is a list of disrespectful language historically used to describe people with disabilities, offers alternatives to use instead. While conversing with a young man in a grocery store one day, Corr cringed as he listened to the man use the “R” word. Corr asked him to think about what the word trust means. On another day, Corr approached a store employee when their establishment did not meet Americans with Disabilities Act requirements. It is all in an effort to help everyone involved, from the person with the disability, to the person who uttered an offensive term, to the store owner, Corr said. “I try really hard to not get angry, but I try to educate,” Corr said. A resident of Troy, Corr has found every way possible to stay involved in the community while continuing his passion for helping people with disabilities. He joined the Troy City Council eight years ago and was recently re-elected for a four-year term. While water is one of the town’s biggest issues, and one Corr said he has a lot of ideas about, Corr has also asked the council to focus specifically on Troy residents with disabilities. In his coaching position with the Troy High School girls’ softball team, Corr bans blatantly disrespectful terms, often used to describe people with disabilities, from his practice. A highlight of his life was meeting Richard Pimentel, a disability rights advocate and the basis for the 2007 movie “Music Within,” at an ADA convention in Boise in 2013. Corr keeps a picture of the experience on his office wall. “It’s amazing that we have people like that and that people don’t know of him,” Corr said. As the DAC’s First Choice In-home Personal Assistants program manager for the last 10 years, Corr’s focus has been keeping people who need in-home assistance out of nursing homes. “The passion that drives me in doing this is the fact that I want to see people that need help in their homes stay in their homes and have their own say,” Corr said. Having worked with people with disabilities for years, Corr has come to learn that, as people grow older, things get harder, and even those who never thought they would live with a disability might find themselves with one later in life. Some already require daily assistance without realizing it, Corr said. They might wear glasses. They might be diabetic. These things, Corr said, are disabilities. And the people who suffer from them need support. Corr said he wishes there were more educational opportunities that existed for Idaho children to learn about people with disabilities and what it is like to live with one. Then, he said, things could change.